Values and ideals motivate and guide our choices. Some are attracted to goodness, others to love, still others to action, beauty, wisdom, loyalty, joy, strength, and peace. Vulnerabilities are the tender underside of our values. We become very sensitive and protective when our values are discounted or threatened. Some are sensitive to criticism, others to rejection, still others to failure, abandonment, ridicule, betrayal, limitations, weakness, and conflict. When we are functioning from the self actualizing and transcending side of our person, we pursue our values and accept our vulnerabilities. Our vision is realistic, our energy is expressed cleanly as a virtue, and our actions are resourceful and fulfilling. When we operate from the self maintaining and defensive side of our personality, we protect ourselves from being hurt and lose touch with what we really want. Our outlook or world view is biased, our energy is distorted into a vice, and our actions disregard our own and others’ deepest needs. To compensate for what we believe we lack, we turn our ideals into unrealistic idealizations and are then tyrannized by our “should’s.” For example if you exaggerate a natural desire to be good, you may become a perfectionist who has to do everything right. From the Enneagram Perspective, these values and vulnerabilities, ideals and idealizations, adaptive and maladaptive visions, virtues and vices, resourceful and non- resourceful behaviors get expressed in nine different personality styles. Through illustrations, videos, and dialogue, this workshop will explore these complementary ways of being in the world. When we over-identify or over-idealize certain aspects of our personality, we tend to disavow any opposite tendencies or attributes. For example if you think of yourself as right and exact, then you don’t want to consider yourself wrong or messy nor do you want others to think of you in this way. Or if you think of yourself as strong and tough, you don’t want to appear to yourself or others as weak and wimpy. To avoid these unacceptable parts of ourselves, we put them in the basement (our unconscious) where we can forget about them. This is called repression. Splitting is a variation on this maneuver. Instead of being a whole me, we become the good me and the bad me. If relics in the basement start to offend us, we can go a step further and throw our garbage out. For example if you think of yourself as wise and perceptive and find looking foolish quite intolerable, you can cast out your foolishness and then find yourself surrounded by a confederacy of dunces. This is called projection. Instead of being a sinner among sinners, you are a rose among thorns, or a good me surrounded by not-so-good you’s. The process of projective identification goes a little beyond projection. Instead of simply throwing our trash out and leaving it in others with a good riddance, we put our unsavory characteristics in others, then process our garbage in them –or cajole others into cleaning up their acts. For example if you project your inner rebel or delinquent onto others, then you will have to police them, reform them, excommunicate them, or throw them in jail. Now, not only have you gotten rid of your demons, you’ve found something to do in your spare time! If we can re-identify with our unseemly parts and re-own them, we might find some valuable assets tossed out with our garbage. We will gain an inner integration and wholesome connections with other people, both of which lead to an increase of energy since we are no longer divided against ourselves and others. A paradoxical quality of polarities is the more we push them to an extreme, the more they run into and become their opposite. Jung called this enantiodromia. For example the more you try to become free and keep all your options open, paradoxically the more un-free and rigid you become as you compulsively try to avoid any limitations. Through illustrations, exercises, and dialogue this workshop will explore each Enneagram style’s ego identifications (me) and their shadows (not-me), the defenses used against the unacceptable parts, and ways of reacquainting us with and reintegrating our disowned characteristics. In short we will learn how to re-label, re-own, and re-use all the dimensions of ourselves. Appreciating differing personality styles with their particular values, points of view, intuitive capacities, and problem solving strengths contributes to a group’s awareness, liveliness, decision-making capabilities, and effectiveness. Understanding one’s own resources and deficiencies leads to greater self awareness, self mastery, and a more effective use of self as a team manager or member. Based on perennial and contemporary wisdom, the Enneagram model provides a system for leveraging this understanding to create change. It deftly describes nine personality styles each with its own way of perceiving, processing and responding to relationships and work situations, while mapping different aspects of one’s personality that are likely to come forward under stressful and peak performance conditions. When all nine energies and perspectives are present, a comprehensive panorama is seen, more options are available, better problem solving procedures are enacted, and more effective action can be taken. Awareness of the blind spots and narrowed perspectives of each style helps lessen conflicts and misunderstandings. The Enneagram paradigm has been used to train leaders and staffs in businesses like Motorola, Navistar, the CIA and the U.S. Post Office. It is being presented in educational settings from the Stanford Business School to the Chicago School System and is applied in Church and retreat settings by various denominations and traditions. 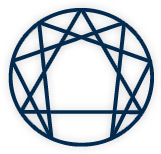 Attesting to its international recognition and acceptance, organizations are using the Enneagram throughout the Americas, Europe, Africa and Asia-Pacific. Possess an additional instrument for problem solving, facilitating decision making, building lively teams, creating collaborative working relationships and reducing unproductive conflict. Be aware of nine different ways of doing business in the world. Enhance their managing, communicating, and influencing skills. Appreciate their own assets and liabilities and become more adaptable in working with others. Discover and develop their own and others’ best selves. These ways remind us of what it means to be human and hint at what it might mean to be divine. All are valid paths for the spiritual journey. We can sometimes travel down false paths that divert us from and substitute for our true path. The Enneagram suggests nine vicious detours. These traps can snare us all. Recognizing what they are can help us avoid them along our spiritual journey. This workshop will explore what these nine spiritual paths look like from the Enneagram perspective. It is meant for both sojourners (those who are traveling) and cojourners (those who accompany us on our travels.) We’ll look at the high road (what it means to live in essence) and the low road (what it means to live out of personality). And we’ll get some directions on how to get back on track if we’ve drifted. The idols of our personality beckon us to security and happiness. But to reach their promised land, we must pledge our unwavering devotion and fealty to them. And should we disobey them and take another route, our most frightening fears will surely be realized. On the other hand, our essence or genuine self invites us to a deeper security and well-being. It is a gentle calling, doesn’t use threats, and so is not as easily noticed. We are accompanied along this path by virtues and guided by appropriate ideas and ideals. We’ll recollect the times when we experienced these virtues and ideals. So what keeps us from being spiritual and prods us to go in a not-so-spiritual direction? Coercion and fear. We’ll remember when we weren’t encouraged or allowed to be ourselves and explore how we stay connected to our idols — to the inner judges of our shoulds and to the outer judges of others’ expectations. We’ll consider what resources we can marshal to offset these fears and touch into what we are passionate about — what divine aspect God is calling out in us now but we’re afraid to let it. There will be some input, personal reflection, experiential exercises, dyad sharing, and large group feedback. Participants will learn the idols and their promises of each Enneagram style. Participants will understand the mythical consequences of disobeying their idols. Participants will understand the fears and coercions associated with their idols. Participants will explore alternative sources of support and protection other than their idols. Participants will reflect on what higher aspects of their selves are being called out from them now. Each of us has an inner child with early acquired sensitivities and vulnerabilities that we seek to protect from being injured again. result of our innate temperament, how we were treated as we were growing up, and how we perceived what was happening at that early age. We develop certain defenses and sometimes a whole interpersonal style to protect our primary vulnerabilities and to make sure we don’t get hurt in the same way again. This workshop will explore these sensitivities of our inner child aided by the insight of the Enneagram which suggests there might be nine areas of primary vulnerability corresponding to nine personality styles. We will see what our often unconscious values and vulnerabilities are; how our present perceptions and reactions might be biased toward favoring and protecting our vulnerable areas; and what alternative resourceful responses might be available to us for taking care of our inner child. Teachers know that not all students learn the same; and students know that not all instructors teach the same. The Enneagram spectrum of personality styles suggests there are at least nine different teaching and learning styles. Each style has strengths in its area of intuition and teaching expertise and possible blind spots to other equally valid modes of learning. Becoming familiar with these nine teaching and learning styles can be useful for teachers at all levels: primary, secondary, college, and graduate. The workshop includes input, videos, personal reflection, and group interaction. Schemas are stable and enduring patterns of thinking that develop during childhood and are elaborated throughout our life. We view the world through our schemas or lenses, which are important beliefs and constructs about the world and ourselves. Since we accept these schemas without question, they become self-perpetuating and are very resistant to change. To the extent that our schemas accurately represent reality, they clarify our vision and are useful and self-serving. If our schemas are out of date, they distort reality and end up being self-defeating. We’ll discover some adaptive or useful schemas for each Enneagram style and what are some typical maladaptive not-so-helpful schemas for each type. Schemas exert their influence on our behavior and strive to ensure their own survival through three processes of schema maintenance, schema avoidance, and schema compensation. In this workshop we’ll consider how these processes operate in the nine Enneagram styles. We’ll see how our schemas maintain themselves by exaggerating information that confirm them or minimizing data that contradict them. We’ll discover how we cognitively, emotionally, and behaviorally avoid triggering our maladaptive schemas to escape the negative emotions they stir up. And we’ll investigate how we compensate for these schemas by doing the opposite of what they suggest so we can evade triggering the pain they cause. Finally we’ll learn how to recognize and challenge our maladaptive schemas and replace them with more adaptive ones. This workshop involves input, personal reflection, small group sharing, and large group feedback.